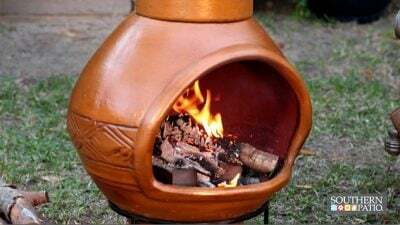 Before you use your chiminea on a regular basis, you need to cure it, bringing the chiminea up to temperature slowly during the first use. Only use it outdoors, and make sure that it has six feet of clearance from any flammable materials, like fences and plants. Add six to eight inches of lava rock, sand or gravel to the inside the base of the chiminea. You can also place two bricks on either side to elevate the wood that you’re burning. The chiminea needs to be dry before lighting the fire. Make sure you remove the chimney cap, then you can light a small fire in the middle. Let that fire burn out naturally, and let the chiminea cool completely. Set a larger fire in the chiminea, and let it burn out, then cool completely. Repeat the process at least two more times, making the fire a little larger each time. To see more planters and products, visit www.southernpatio.com.